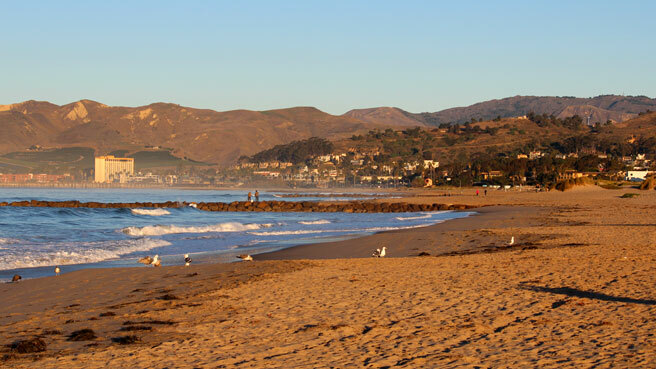 A low-key alternative to LA beaches, Ventura State Beach has grass for picnicking, walkways for exploring and seafood galore. Once you’re done watching the surfers, take baby inland to the small downtown Main Street for an antique rattle. Atmosphere: Ventura isn’t as built up as other beaches, and does have some run-down streets along the coastline. However, the beach is just as beautiful on a sunny day and less expensive than points south. Parking and Entrance: Park at the end of Seward Avenue for free if you want a quieter, more local experience. Otherwise, park in the day use parking lot for the state beach (officially called San Buenaventura) and take advantage of the snack bar and beach gear rentals. You may have to cross some sand dunes to get onto the beach. Nice Walks and Views: Put the jogging stroller to use on the pathway that runs along the 2-mile beach. Walk from the state beach entrance past the pier to Promenade Park (a wide walkway with grass) and Surfer’s Point, where you can catch surfers both surfing and chilling in the small parking lot. You’ll end up at the Ventura County Fairgrounds. Activities for Toddlers: There’s a playground in the state beach and beach rentals are available seasonally. Let your toddler try her hand at boogie boarding (or just laying on the board while you pull her up the sand dunes). Bathrooms: Bathrooms are at Seward Avenue in the parking lot, in the state beach day use area and along Promenade Park. Perks for Parents: Get crackin’ at The Jolly Oyster, a shuck-your-own-oyster place in the state beach. Pick up some charcoal and beer and cook your very own seafood meal. Let baby roll in the grass while you enjoy some alone time with your aphrodisiac. Where to Stay with Kids: For the easiest access to the beach with a short-tempered toddler, choose the Crowne Plaza at the foot of the pier. Great amenities are available at the Comfort Inn, which offers a hot breakfast at Denny’s, nearby fast food, fridges and microwaves, still within walking distance to the beach. Baby-friendly Restaurants: Beach House Tacos, on the pier, has better-than-average fish tacos in a great location. What Else to Do: Head 3 blocks inland to Main Street, a downtown full of antique and thrift shops and bars. Six Flags Magic Mountain is 45 minutes south in Valencia.